New York, NY (April 7, 2017) – Taste of Tribeca, Lower Manhattan’s acclaimed outdoor food festival, kicked off its 23rd year on Friday, April 7, 2017. Tickets are on sale to the public at www.tasteoftribeca.org. Taste of Tribeca brings together over 60 of Tribeca’s top chefs and restaurants to benefit arts and enrichment programs at local public schools PS 150 and PS 234. Ticket holders are entitled to six dishes and three drinks from participating neighborhood restaurants including Michelin star recipients Bouley, Brushstroke and Jungsik; neighborhood favorites Restaurant Marc Forgione, Terra Wine Bar, Scalini Fedeli, and Takahachi; and new additions Bâtard, Schnippers, and Yves. The festival’s Golden Restaurants – Bouley, Bubby’s Tribeca, Duane Park Patisserie, Gigino Trattoria, The Odeon, Tribeca Grill, and Walker’s — are back again with the classic dishes that have made the festival successful since 1994. New to the festival is a raffle for the chance to win a brand new 2015 Vespa Sprint 50 scooter, courtesy of Vespa Manhattan. Raffle tickets are available now at www.tasteoftribeca.org, and also will be sold at Vespa Manhattan’s booth at Taste of Tribeca on May 20. Also new: a series of interactive pasta-making stations for kids led by talented chefs from Eataly NYC Downtown. Children will learn to make pasta dough, fill ravioli, and cut pasta by hand, and at the end will be invited to take some of their pasta home with them! The Beer and Cider Tour of Tribeca is back for the third consecutive year. The tour boasts beer and ciders sourced from New York breweries, including newcomer SingleCut Beersmiths from Astoria, Queens. It will be hosted by establishments around the neighborhood such as Church Publick, Reade Street Pub and Woodrow’s. 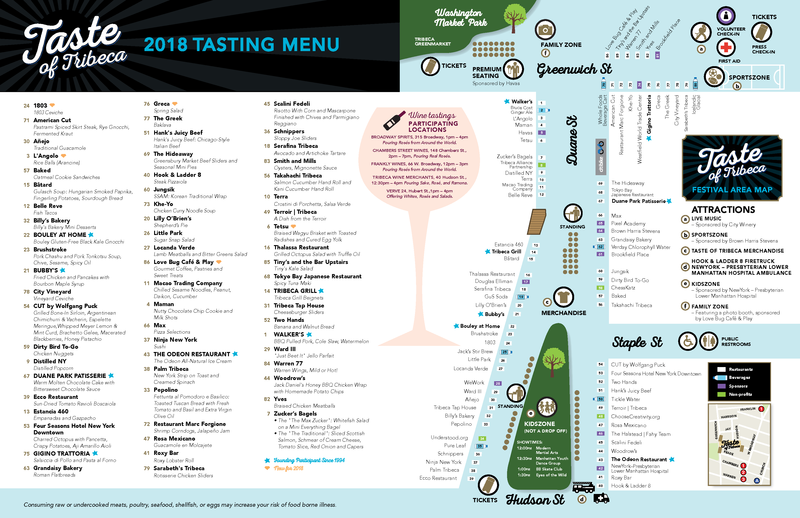 General Tasting Cards ($45 early bird, $55 day of event) provide six hearty “tastes” from any of the participating restaurants and three drinks, including two pours of beer or cider. Premium Seating ($700 and $1000 for tables of four and six) includes reserved VIP seating for the duration of the event, Tasting Cards, table service by student volunteers from local high schools, designer t-shirts, and a gift bag from Taste of Tribeca sponsors. All tickets include lots of family fun. Family and kids’ activities include the SportsZone presented by Manhattan Youth; the KidZone featuring performances by Loonie Lenny and STEM activities led by Pixel Academy; and live entertainment by Cynthia Sayer, the Tribattery Pops, and young musicians from the Church Street School for Music and Art. Taste of Tribeca is grateful for the support of our sponsors, led by Citigroup for the fourth consecutive year and newcomer 100 Barclay, and also including Douglas Elliman, Brown Harris Stevens, and New York Presbyterian-Lower Manhattan Hospital. Taste of Tribeca is a truly unique event that unites the entire downtown community in support of two outstanding local public schools and invites all of New York City to explore Tribeca’s delicacies. Taste of Tribeca 2017 will take place on Saturday, May 20 from 11:30am to 3pm, rain or shine, on Duane Street between Greenwich and Hudson Streets. We hope to see you there!